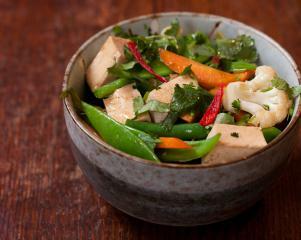 This is a nice light weekday stir fry, it works well just as a bowl of veggies and tofu or with rice on the side. Prepare the vegetables, cube the tofu, finely chop the spring onions, garlic and chilli and roughly chop the coriander. Combine the sauce ingredients in small bowl. Add a little oil to a very hot wok or fry pan. Then add the chilli, garlic and spring onion, after a minute add the tofu. Stir fry for half a minute and then add the harder vegetables (carrot, broccoli, beans and the like) and most of the coriander. After another half minute add the sauce. When the vegetables are almost cooked add the lighter vegetables (snow peas, chinese broccoli leaf). When it is all cooked serve with the remaining coriander.